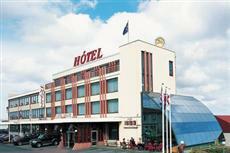 The hotel Keflavik is located 5 minutes drive from Keflavik airport, in the centre of Keflavik town overlooking the harbour. A great, conveniently located hotel, saving time for those arriving late at night or departing early in the morning. A modern grey brick building with reddy-brown windows and doors. The lobby is small and smartly decorated with a a leather seating area, separated from the reception desk. This is simple, but attractive in design with dark wood furnishings. The rooms are medium in size and are kept in very good condition along with the bathrooms. All rooms are well equipped with modern facilities, but retain a traditional feel. Both the rooms and the bathrooms are in very good condition. There is a medium-sized breakfast room on the ground floor with smart new furniture and a modern design throughout. There is also a cafe on the ground floor, which is extremely bright with ground to ceiling windows. A popular pub is located next door. 1 kms to city centre, 1 minute walk to the nearest bus stop, 50 km to the nearest fair site (reykjavik), 7 kms to the nearest airport (keflavik international).